Valentine's Day is tomorrow and John Wick 3: Parabellum has you covered if you forgot to get some cards. Lionsgate has uploaded a set of seven different cards, one for each day of the week for the couple that is really crazy about each other. Each of the cards is customizable, so you can really get into the killer details for your messages of love that you wish to send out. The Valentine's Day cards are also a good reminder that the sequel is on its way. The first of the Valentine's Day cards reveals that the character will "go to hell and back for you," which is a pretty nice thing to do for somebody that you love. From there, we have the "fight for you," the "ride or die," "you're the one I've been looking for," "you're killer," "we make a great team," and finally, "love is: running in the rain with you." Each of the different cards has an image from the movie that corresponds to the message. If you're not into the whole violent world of John Wick, you can customize each card to send out a less extreme Valentine's Day card that just features imagery for the movie. Whatever the case may be, this is a great marketing strategy to promote the third chapter in the franchise. While some fans have expressed disappointment with the series coming to a close, that might not be the case. Director Chad Stahelski has revealed that there are a ton of ideas to keep the franchise going. Whether or not we get anymore in the franchise past John Wick 3 with Keanu Reeves is a mystery, but if the movie does well at the box office, which it probably will, we could end up seeing some more of our favorite assassin on the big screen. With that being said, Reeves is going to take a break from being a killer to jump into another sequel that people have been waiting nearly 30 years for. Bill & Ted 3 is expected to begin shooting next month and Reeves will be a lot different from his killer character. 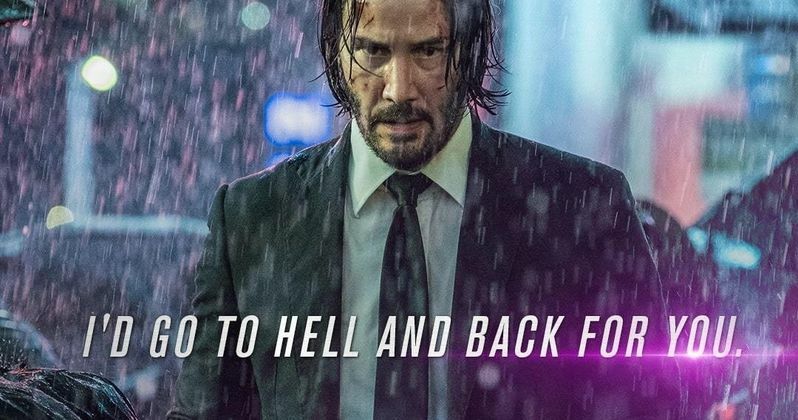 John Wick 3 hits theaters on May 17th, which is right around the corner. Lionsgate recently released the first trailer for the movie and it had everything that the franchise has been known for, but amplified to a whole new level of extreme. Chad Stahelski was not kidding around when he claimed that the upcoming movie was going to be even more action-packed and bloody than the previous installments. Thankfully, the wait is almost over. While we wait for the movie to open in theaters, there's plenty of time to watch the first two installments with the person you love most. You can check out the John Wick 3 Valentine's Day cards over at Lionsgate.